Height: 6' 5" Weight:320 lbs. Background: When you draft a player eighth overall in the NFL draft, you had better hit on the pick, particularly if you trade Pat Swilling to get him. 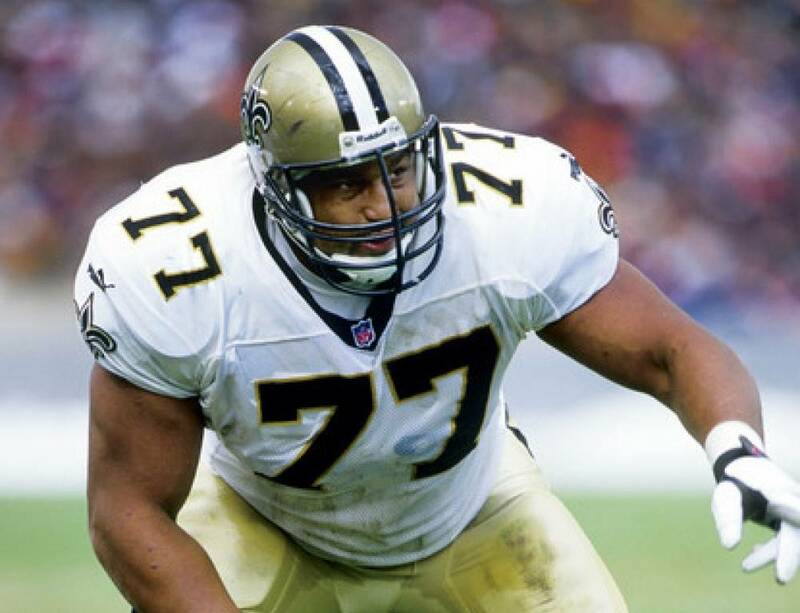 Suffice it to say that the New Orleans Saints hit the jackpot in choosing William Roaf in the first round of the 1993 draft out of Louisiana Tech. Nicknamed "Nasty," Roaf became one of the best tackles in NFL history. Nine seasons later, Roaf had been to seven Pro Bowls, living up to the nickname as a devastating blocker. He was an instant hit, earning a starting job and starting all 16 games in his rookie season. He started all 16 games in six of his nine seasons in New Orleans, starting all 131 games he played in as a Saint, ranking 24th in games played in franchise history. He earned a pair of first team All-Pro honors and was named to the NFL Team of the Decade for two consecutive decades, an illustration of his brilliance. He was named to the Pro Bowl in all four of his seasons in Kansas City after being traded by the Saints, something that never should have occurred. "When I got to New Orleans, the Saints had been winners for quite some time under Coach (Jim) Mora," Roaf said. "It was tough not winning. Losing is no fun for anyone. It was so nice to finally win in 2000." It is hard to compare an offensive tackle to quarterbacks, running backs, wide receivers or even defenders who collect sacks or record interceptions. There was no better player in New Orleans Saints history than William Roaf. Only Morten Andersen, Drew Brees and Rickey Jackson can match his excellence in performance and the trio surpassed Roaf in time served with the Saints. Greatest Moment: Roaf had so many dominant performances that you could single out several different games. When it comes to a crowning moment in New Orleans, it had to be Dec. 30, 2000. Hosting the defending Super Bowl champion St. Louis Rams, the Saints held a commanding 31-7 lead early in the fourth quarter, seemingly coasting to an improbable, impressive, first ever playoff victory in franchise history. Back stormed "The Greatest Show on Turf," scoring 21 unanswered points and forcing a New Orleans punt. With many anticipating an awful ending Az-Zahir Hakim, who would later play for the Saints, dropped the punt and Brian Milne recovered, sealing the first playoff victory in the 34 year history of the New Orleans Saints. Roaf was the best player on the team. He had finally experienced winning. Honors: Roaf was inducted into the Saints Hall of Fame in 2008 and he was an inaugural inductee into the Saints Ring of Honor in 2013. He was elected to the Louisiana Tech Hall of Fame in 2003 and the state of Arkansas Hall of Fame in 2007. He was inducted into the Louisiana Sports Hall of Fame in 2009 and the Greater New Orleans Sports Hall of Fame in 2012. Also In 2012, he received the biggest honor of all with his induction into the Pro Football Hall of Fame. 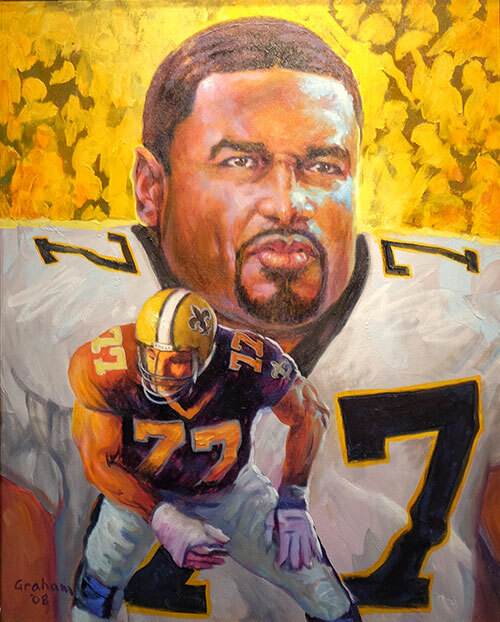 Roaf was named first team All-Pro in 1994 and 1995 and was named to seven consecutive Pro Bowls while with the Saints (1994, 95, 96, 96, 98, 99, 2000). Roaf was named to the Pro Football Hall of Fame NFL Team of the Decade for both the 1990's and 2000 decade.